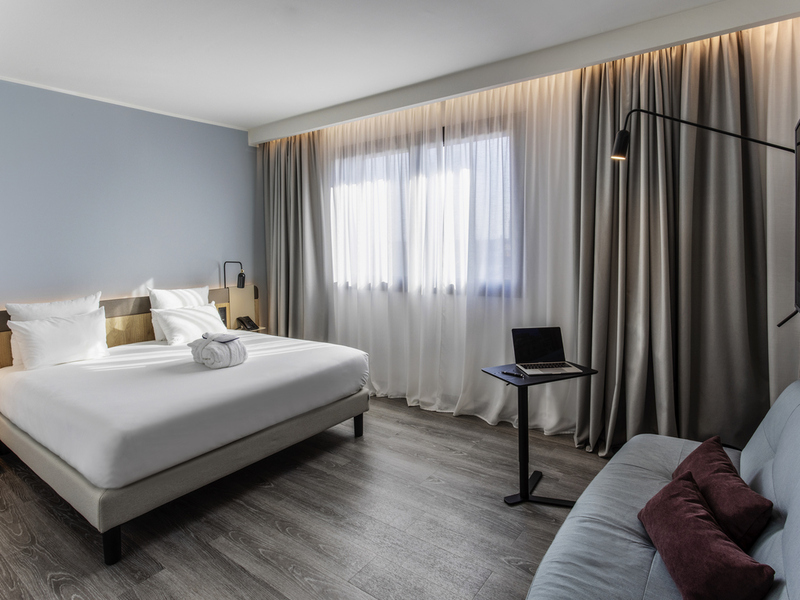 The Novotel Parma hotel is located on the doorstep of the historic city center, a two-minute walk from Parma train station and a ten-minute walk from Piazza Duomo, the city's main monuments and the lush green setting of Parco Ducale. Thanks to its comfort able rooms and fully equipped convention center, the hotel is ideal for business travelers as well as those who want to discover the history and culture of the city, which is home to the university and rich in world-renowned gastronomic traditions. Spacious and adaptable, with a contemporary design, the Novotel Room is truly a place for living, perfect for all your needs. The San Barnaba Restaurant offers high-quality dishes based on traditional Parma cuisine, one of the most representative of Italy. Our chef's offerings are made with carefully selected typical local produce. The Chateau bar is open every day and welcomes guests who want to take a break and relax with a drink.